Are you thinking of selling your Door County home next year, pondering whether to list it for sale now or wait until sometime after the New Year? The Dave Ramsey site says that “existing home sales have increased from November to December an average of 4.5% in the past three winters”. It would seem then that winter buyers are actively looking and motivated to buy a home. Serious buyers are always in the hunt for the latest listings on their computer at lunch, in the car waiting for the kids after basketball practice, and just before bedtime on their tablet. The internet does not care if someone thinks spring or summer is the time to list houses—it has them available 24/7. I tell sellers your first showing will be on the web, and that’s why photos are so important. Over the past two years I found 98% of the buyers I worked with began their home search online. By the time we talked they had already developed a pretty good idea of likes and musts. That’s why photos are so important, they must be high-quality phones that show off the home’s best features. Exterior photos are just as important, and drone video and photos are becoming increasingly necessary. Holiday time or not, decorations should accent and not overcrowd or overpower. Less is more. Have the windows, inside and out, cleaned. Clean, unobstructed windows will make every room more inviting. Clear the clutter from cabinets and closets, it will make them appear larger. In the kitchen organize the dishes and glasses in the cabinets and the canned and boxed food in the pantry. Be sure to organize under the kitchen sink–its one of the first places people seem to look. Clear the clutter from closets too. If your closets are packed store seasonal clothing. 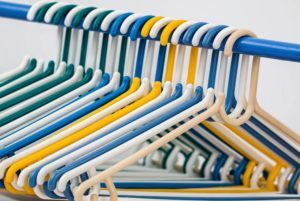 Have everything neatly folded or on a hanger. Install a shoe cubby, or put shoes in a neat line. I have a seller who went so far as to color-code the clothes—all the blues together, the reds together, etc. I have to say it made an impressive looking closet. Clean the ceiling fan blades, the light fixtures, polish the furniture, polish the chrome faucets, if you cannot bleach dingy looking grout then recaulk around the sinks, shower and bath tub. Clean out the refrigerator and be sure to catch the seals. Clean the oven. Keep the path to the front door and garage or outbuilding doors clear of snow. No one wants to walk through knee-deep snow. By the time they get into the house they are too cold and wet to think of anything. If you have a fireplace. light it for the showing—yes, even in the middle of the day. Set out a plate of fresh-baked cookies and a beverage. Inside the house, turn all the lights on—again, yes, even in the middle of the day. If the showing is going to occur near dusk have a few path lights or exterior spotlights to brighten the scene. Open the blinds and draperies. And make sure the windows are clean. Clean, unobstructed windows will make every room more inviting. Turn on the closet lights. Don’t have lights in the closets? Get some of those battery operated stick up lights and turn them on. Go easy on the scents. Don’t rely on candles and room fresheners to take out odors. We all have odors in our house. Clean the house, clean the carpets, take out the trash to accomplish that. Some people find the scent of candles and room deodorizers offensive, and often wonder what the buyer is trying to cover up. Would this fireplace and room look better, more inviting with the fireplace lit? As mentioned above it is important to keep a path shoveled to the door so people don’t have to walk through snow to get to the house. 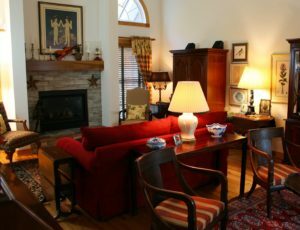 It is equally important to provide a comfortable temperature inside the house for the viewing. There is nothing worse than a cold house, and buyers do not want to linger long in them. A comfortable temperature gives the buyer some incentive is take a little bit longer imagining if yours is the right house for them. Speaking of the heat, some HVAC systems are loud. It is better to heat the house a couple of degrees warmer and then set the thermostat to the normal temp. That will prevent the system from kicking in during the viewing. You do have two chances to make a good impression, one is when a buyer views your property online. The other is when they step into your front door. One other thing I suggest sellers to do is to clean up the basement too. Get rid of the cob webs, clean the walls and floor, clean the tops of the furnace, water heather, etc. If the basement is clean it will impress a buyer. Motivated buyers are looking online 24/7. With a little extra effort on your part, and a good Realtor partner, you can market and sell your house in the winter. Call me today and let’s talk about a plan specifically for you.